The market continues to ascend unabated, the SP500 is now up 7 days in a row, the QQQ is up 9-days in a row, and the Nasdaq composite is up 8-days in a row. There’s a rumor going around that a multi-billion dollar fund which is short volatility and short ES contracts is getting squeezed. 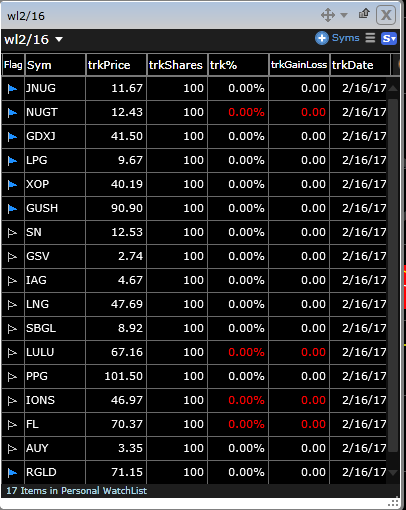 Something about a complex options strategy that eats like a bird but shits like an elephant (selling naked calls). In the very short-term it is hard to get overly excited on the long side because the market goes up and down not up or down. However, my scans are still spitting out a decent amount of good set-ups, today specifically in the gold sector. $JNUG $GSV $IAG $RGLD $AUY $SBGL are the gold stocks of interest today if and only if they can get through yesterday’s high.